Product #3885 | SKU Z-HG-ZW | 0.0 (no ratings yet) Thanks for your rating! 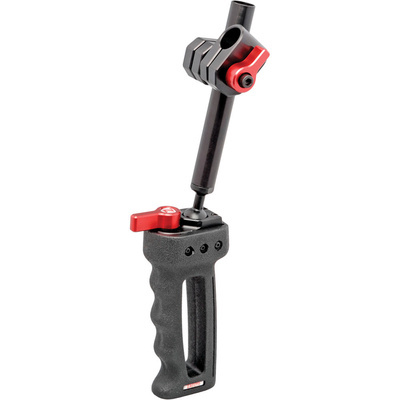 The Zgrip Z-Mount Zwivel Handgrip from Zacuto comes with a black 114 mm rod and a Z-Mount Zwivel. It easily mounts on any 15mm rod with the quick release handgrip. The Zwivel allows you to change the angle between two 15mm rods by loosening the single lever that controls both the 15mm holes. Adjustments to achieve the desired angle are possible by the separation between the parts induced by the integrated spring. The Zwivel allows you to change the angle between two 15mm rods by loosening the single lever that controls both the 15mm holes. The Handgrip supports all 15mm rods with the quick release handgrip. The integrated spring separates the parts for you to achieve the desired angle between the rods.